After Australia Day, we gave ourselves a long weekend and took a roadtrip to central western NSW. Our first stop after we got over the Blue Mountains was the historic gold mining town of Sofala, NSW Australia. A walk down the main street led us to a fine piece of Australiana street art. 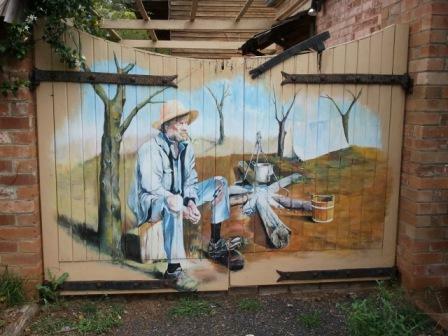 This entry was posted in Blog and tagged Australia, Sofala, Street Art, travel. I love this, such a great piece of art and well photographed! Thnx. I’d been “collecting” street art in my city neighbourhood, so finding this great street art out in the country was a bonus.